Tonight as I type, I listen to Annabelle in the other room. She’s sleeping, or at least trying to. I hear the hum of her oxygen concentrator running and the occasional dreaded beep of her pulxeox machine. I hear her sweet lungs cough with all the force they can muster and the occasional moan or cry out. My brain KNOWS not to worry. It’s a cold. All kids get colds. This is normal. This happens. But… my heart automatically goes there. What if her weakened lungs can’t get that junk out like normal kids. What if her weakened immune system can’t fight off this crazy cold. What if she’s congested because her heart is failing. What if this is the start of the dreaded rejection word that all transplant parents fear. What if I fall asleep and her alarms beep and I don’t hear them. What if I’m overlooking something, some sign that should tell me to rush to the hospital for help. By nature, I’m not a huge, huge worrier. I’m the last Momma to take my kids to the doctor, because I always assume it’s just a cold or a virus… and I’m usually right. But my Annabelle brings out the worrier in me. Our heart kiddos are unique. Colds are SCARY. Many symptoms of a cold (such as lethargy and congestion and fever) are also symptoms of heart failure. And many of our kiddos have spent a pretty extreme amount of time on a ventilator when they are infants, so they have compromised lungs in many cases. And while being sick wears out a healthy-heart kiddo… our children with hearts that have been patched to work are brought down much easier and faster by viruses. They just can’t handle them as well because their body is working so hard on a normal basis, especially those living with half a heart like Annabelle was. Two days after her first birthday…. and was lifeflighted to Vandy Children’s. Yes, this is why us Mommas worry. So… it’s morning now, and I’m finishing this blog. Annabelle woke up smiling and so excited to see me. Of course, this was after being up past midnight coughing… and waking up screaming at 4 am, making me need to give her more Tylenol to calm her. My worry has lessened. The what-ifs are fading again. They are still there. In the back of my mind. Trying to haunt me. As a heart-momma who loves and trust Jesus, I know the only thing to do to get through it, to cope with the what-ifs, is to bundle them all up and fall at the feet of Jesus and drop them right there. I trust Jesus with my worries and fears. People many times tell me that I shouldn’t worry. That I should trust God and be totally at peace. To that I say: HA HA HA HA yeah right. Trusting Jesus with our worries is much different than not having them in the first place. We all have them. It’s human and honestly, if you are a parent and don’t ever worry about your kids, I’d be concerned about you. It’s what we do with those worries that is the key. So this morning, my watchful eye is trained on my sweet girl, making sure there is no sign that I need to call a doctor or take her in somewhere. Yet I’m trusting Jesus to give me the instincts I need to take the best care of her that I possibly can. Your prayers that she continues to get better and stops scaring the spit out of her momma is appreciated. I hear you and I know definitely know that battle. My favorite scripture passage to help me handle the worries if Philippians 4:4-8. I've read and prayed this passage many times. I will be praying for Annabelle, you and the rest of your sweet family. So many typing errors on the previous post. Sorry! I need to get in the habit of proofreading before I post. The post should read, "… I definitely know…" and "… handle the worries is Philippians…"
Tammi– she's doing MUCH better! 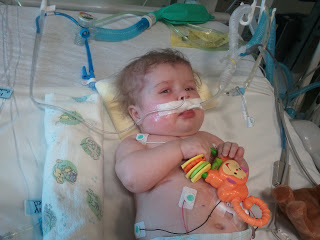 AFter some pretty scary moments after I last posted, she's finally off ECMO and got her chest closed today. Steps in the right direction!! Worry is natural; trusting God (with our sinful nature) is not. A great pastor said that in 2013 we will have times of fear. To combat fear, we must have faith. God is Annabelle's Creator. Just like the rest of us, God alone knows the number of Annabelle's days. IF (and I pray it won't) something happens, it will be because it was God's timing for Annabelle, not the failings of her diligence and watchful mother. I had a friend who died in high school of heart disease (only discovered a few months before she died). Yet, she was such a special person that she is remembered today, and I still keep in contact with her family 13 years later. Annabelle has already had an impact on more people than most adults! I hope I am not sounding like a doomsayer. God gave Annabelle a new heart, and I believe she is supposed to live and THRIVE. I have a friend whose husband had a heart transplant. They are very careful and have watched sermons from home (yea Internet…) during this flu season. Be prudent, but leave the rest to God. And…a comment about your latest book a few posts back (I don't know how much you go and check for new comments on old posts). I've had to confront several people with their sin recently. Pray before confronting and try to determine if it is God's message or just your own anger about something. Some things are annoying and disrespectful but not necessarily sin. Here is one thing God has taught me: Confront but don't keep rehashing it. In my case, the people do not recognize the sin, so I've stated my point and I'll let that sit on their hearts. Also, when a person tells the truth according to the Bible, the person does not need to do any defending (that is from a book I am reading). The Truth can stand by itself. On another note, I have a great true story that I think would make a great devotional (somewhere), would you be willing (once I write it…) to read it over and give me suggestions? It probably won't be longer than a typed page or two. Thanks for considering it. I've got your email. I agree that leaving our worries to Jesus is the answer, but I also agree that God gave us worry to help us take action and be aware. As a mother, I am also not a worrier by nature, but in a serious situation I can mull things through my mind with the best of them. You have a precious child who is seriously ill. Of course you are going to worry. Your post has touched my heart and has reminded me that all too often our worries are insignificant in comparison. I will keep Annabelle in my prayers. Blessings to you and your family. So many times people urge "us" (said in a very broad sense… not just my family!) to not worry, and while that is very Godly, it is much more complex than that. It is truly an every day, every moment action of giving those concerns we have to God. And you are absolutely right, God DOES give us those pricks in our heart at times that we need to be sensitive to as a call-to-action on the part of our child. God has entrusted her into my care, and I do have a responsibility to be her momma and caregiver… but God is with me every step of the way.